Yesterday we got our first look at Kate Winslet as Jeanine Matthews from USA Today. This made me want to use a quote from the first time that we meet Jeanine. A woman sits behind a metal desk. I stare at her face. The same face dominates the Erudite library; it is plastered across every article Erudite Releases. How long have hated that face? I don’t remember. “Sit,” Jeanine says. Her voice sounds familiar, especially when she is irritated. Her liquid gray eyes focus on mine. “Sit,” she says again. I have definitely heard her voice before. She is the danger Tori and my mother warned me about, the danger of being Divergent. What did you think about Jeanine the first tome she talked to Tris? We will see Kate in all of her Jeanine glory on March 21, 2014. Categories: Jeanine, Word Wednesday | Tags: Word Wednesday | Permalink. Today’s Word Wednesday is from chapter 2 of Divergent. Since Entertainment Weekly released a few new Divergent movie stills I decided to relive meeting Tori. Susan grins nervously at me as she walks into room 5, and I walk into room 6, where a Dauntless woman waits for me. She is not severe-looking as the young Dauntless I have seen. She has small, dark, angular eyes and wears a black blazer-like a man’s suit and jeans. It is only when she turns to close the door that I see a tattoo ok the back of her neck, a black and white hawk with a red eye. Her hair is black and straight, but in the light I see that it is streaked with gray. Categories: Divergent, Tori, Word Wednesday | Tags: Divergent, tori, Word Wednesday | Permalink. Word Wednesday: Tris zip lines! Chapter 17 is when Tris zip lines for the first time. This scene to me is where she truly realizes that she is one of the Dauntless. The fearlessness that sh displays shows that. “Held secure by my straps, I throw my arms out to the side and imagine that I am flying. I plunge toward the street, which is cracked and patchy and follows perfectly the curve of the marsh. I can imagine, up here, how the marsh looked when it was full of water, like liquid steel as it reflected the color of the sky. What are your thought on this scene? Sound off in the comments below. Categories: Tris Prior, Word Wednesday | Permalink. 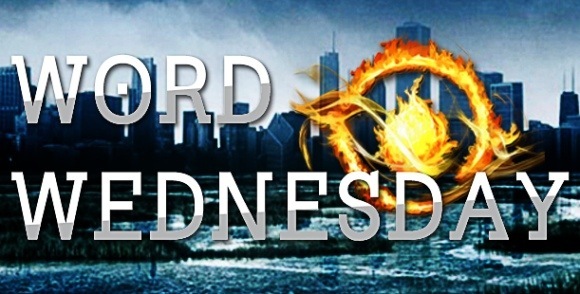 Word Wednesday – Tris chooses Dauntless! Yesterday we had the Divergent read a long with Divergent Examiner and someone brought up the scene where Tris chose to be Dauntless. This happens at the end of chapter 5. Tris did not know which faction she was going to choose until she was handed the knife by Marcus Eaton. Her brother Caleb had already switched factions by choosing Erudite and Tris did not want to be the second child to leave her family. In the end she realized that she had to do what was best for her. She then chooses Dauntless. Marcus offers me my knife. I look into his eyes-they are dark blue, a strange color- and take it. He nods and I turn toward the bowls. Dauntless Fire and Abnegation stones are both on my left, one in front of my shoulder and one behind. I hold the knife in my right hand and touch the blade to my palm. Gritting my teeth, I drag the blade down. It stings, but I barely notice. I hold both hands to my chest, and my next breath shudders on the way out. I open my eyes and thrust my arm out.My blood drips onto the carpet between the two bowls. Then, with a gasp I can’t contain, I shift my hand forward, and my blood sizzles on the coals. I am selfless. I am brave. Categories: Divergent, Tris Prior, Word Wednesday | Tags: Dauntless, Divergent, Tris, Word Wednesday | Permalink.